A special thanks to all! I wanted to let you know how much I have enjoyed the little extras you send with my orders. I have used them in my bird toys and have made them a regular part of my toymaking. Thank you again. - Becky R.
I'm really excited about your website. Not only are the prices great, but the variety of toy parts are too! Looks like Pico and I will be doing some shopping online tomorrow! - Cindy J. Thank you so much for my recent order, I am hooked! I honestly did not think IÃƒÆ’Ã†â€™Ãƒâ€ Ã¢€â„¢ÃƒÆ’Ã¢€ ÃƒÂ¢€Ã¢â€žÂ¢ÃƒÆ’Ã†â€™ÃƒÂ¢€Ã…Â¡ÃƒÆ’Ã¢€Å¡Ãƒâ€šÃ‚Â¢€ÃƒÆ’Ã†â€™Ãƒâ€ Ã¢€â„¢ÃƒÆ’Ã¢€Å¡Ãƒâ€šÃ‚Â¢ÃƒÆ’Ã†â€™Ãƒâ€šÃ‚Â¢€ÃƒÆ’Ã¢€Â¦Ãƒâ€šÃ‚Â¾ÃƒÆ’Ã†â€™ÃƒÂ¢€Ã…Â¡ÃƒÆ’Ã¢€Å¡Ãƒâ€šÃ‚Â¢d place another order so soon after speaking to you! - Vanessa S.
The Foraging Blocks look WONDERFUL!!!! Thank you for adding these most wonderful items to your website!!! Hugs, hugs & more hugs of appreciation! - Janis D.
I just love all the parts to make my own toys. Debbie you have helped me so much thank you .. I want to order again! - Deborah K.
My bird, Bailey, loves that I can create custom toys just for her! I can buy the toy parts she likes best and put them together each time she's ready for a new one to explore. - Melissa K.
Here are Lili and Boo. This toy is made with "parts" bought from your store and made by us. These 2 can destroy a toy this size in 1 day! Well it's easy to say ... the samples of Mahogany Pods you sent along in my last order were an immediate success!!! No hesitancy! No ... "What's that?!" Placed it in Kea's toy bowl ... he went right to it, spent only a few moments checking it out & then quickly went right to crunching it to bits!!! Nothing left! Placed another in his bowl that same afternoon ... he LOVEÃƒÆ’Ã†â€™Ãƒâ€ Ã¢€â„¢ÃƒÆ’Ã¢€ ÃƒÂ¢€Ã¢â€žÂ¢ÃƒÆ’Ã†â€™ÃƒÂ¢€Ã…Â¡ÃƒÆ’Ã¢€Å¡Ãƒâ€šÃ‚Â¢€ÃƒÆ’Ã†â€™Ãƒâ€ Ã¢€â„¢ÃƒÆ’Ã¢€Å¡Ãƒâ€šÃ‚Â¢ÃƒÆ’Ã†â€™Ãƒâ€šÃ‚Â¢€ÃƒÆ’Ã¢€Â¦Ãƒâ€šÃ‚Â¾ÃƒÆ’Ã†â€™ÃƒÂ¢€Ã…Â¡ÃƒÆ’Ã¢€Å¡Ãƒâ€šÃ‚Â¢s it!!! Thank you for sending along something new to try! 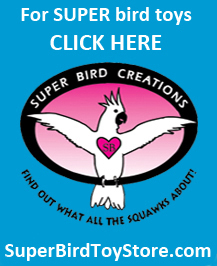 - Janis D.
Make Your Own Bird Toys is the best site everÃƒÆ’Ã†â€™Ãƒâ€ Ã¢€â„¢ÃƒÆ’Ã¢€ ÃƒÂ¢€Ã¢â€žÂ¢ÃƒÆ’Ã†â€™ÃƒÂ¢€Ã…Â¡ÃƒÆ’Ã¢€Å¡Ãƒâ€šÃ‚Â¢€ÃƒÆ’Ã†â€™Ãƒâ€ Ã¢€â„¢ÃƒÆ’Ã‚Â¢€Ãƒâ€¦Ã‚Â¡ÃƒÆ’Ã†â€™ÃƒÂ¢€Ã…Â¡ÃƒÆ’Ã¢€Å¡Ãƒâ€šÃ‚Â¦ÃƒÆ’Ã†â€™Ãƒâ€ Ã¢€â„¢ÃƒÆ’Ã¢€ ÃƒÂ¢€Ã¢â€žÂ¢ÃƒÆ’Ã†â€™ÃƒÂ¢€Ã…Â¡ÃƒÆ’Ã¢€Å¡Ãƒâ€šÃ‚Â¢€ÃƒÆ’Ã†â€™Ãƒâ€ Ã¢€â„¢ÃƒÆ’Ã‚Â¢€Ãƒâ€¦Ã‚Â¡ÃƒÆ’Ã†â€™ÃƒÂ¢€Ã…Â¡ÃƒÆ’Ã¢€Å¡Ãƒâ€šÃ‚Â¦thank you for being out there for bird owners on a budget! 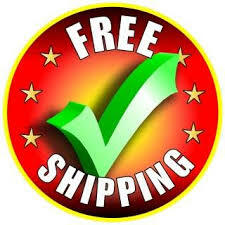 - Angie D.
On behalf of my flock I want to say thanks for the great service, products and prices! - Gay T.
Always a pleasure to shop with Make Your Own Bird Toys. 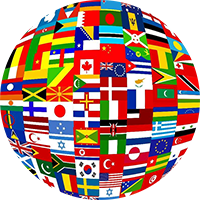 Great selection of toy parts, fast shipping. The birds love the toy parts. I love the goody bag. My husband especially loves the candy. It's a win, win, win for everyone here. Thanks for being such a great company to do business with! Awesome toy parts for the toymakers. Huge selection, and great prices. Every toy part you ever wanted is here, no need to look further. Whether it be plastic, metal, wood, or even natural products. 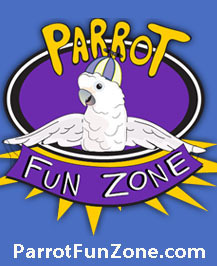 Your birds dream come true here. Prices are excellent, shipping is fast, and you get a goodie bag with thank you items included. You guys are the best! Beads, blocks, bagels, whatever you buy it is the highest quality, colored beautifully and the best. 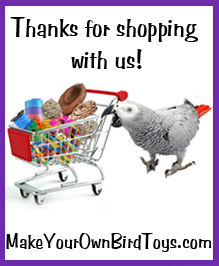 All of your birds will love you for buying them the best toy parts anywhere! Excellent prices! My parrotlet tears through his toys very quickly as most birds do. 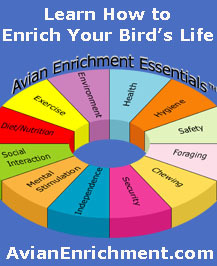 Thanks to this website, I will be able to supply my bird with an ample supply of toys at an affordable price. I highly recommend this site! Great prices and merchandise delivered quickly! Not only did my last package arrive in a timely manner, but there was a little goodie bag in there that made my day! From myself and Rosie the Conure, thank you for making the experience a pleasant one! I am so happy I found this website! I recently got my first bird, a pacific parrotlet. A couple days ago I was looking at his toys and wondered where I could get parts of them. A quick "DIY bird toys supplies" google search brought me here! Everything seems very well prices and everything is so cute! I'll be ordering soon! I love this store! 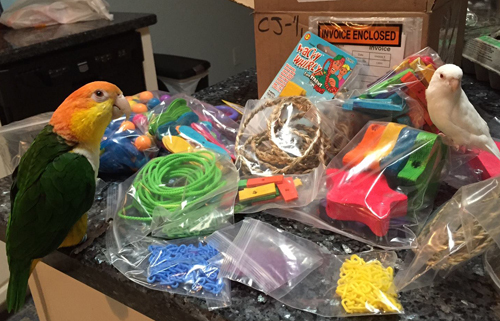 I order parts for bird toys often that I make for my business and the turnaround time on orders is fast. The cost is low but that doesn't mean you suffer on quality, the quality is top notch. I love the extras, including the candy. Don't ever decide to close because I would be super sad. You guys rock! Thanks from all of us at Pipers Playhouse. 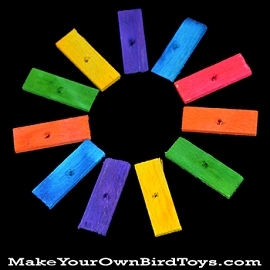 Best selection of brightly colored bird safe toy parts anywhere. Natural, Paper, Wood, Plastic, you name it I use them all. Keep up the good work making bird toy parts available to the public! I had a great time shopping on this website, not only because of the wide array of amazing products I found, but also because of the organization of the categories. When my order came, I was beyond impressed with the quality of products sent. This is a five star website in my book. Very satisfied! 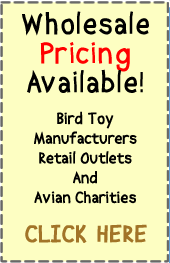 The best selection of wood, plastic, & natural bird toy parts anywhere. And all the bird safe metal parts you need when making your own bird toys. The best prices on the internet. Fast shipping. Awesome freebie toys and candy to make any husband happy. What more could you ask for? Happy birds, happy husband, happy wife. Makes for a happy life. My Cockatoo Lucy loves her toys I ordered last time! This is my second order. Looking forward to keep ordering from you in the future! So glad you guys exist! I was looking for a way to make my own toys for my Cockatiels and you have everything I need!! Great items. Out of stock on some things I picked out but found good substitutes. Hoping my Amazon will like her new toys. I love the options you guys have! And you always include a little extra something which is so nice, it’s such a pleasure having finally found a place where I can buy bird supplies for bird toys for cheap! Toys can get so expensive in the store and I have more fun making them anyway. Thanks so much! 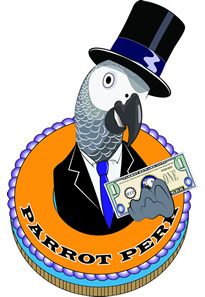 Fair pricing on all the toys that our African Grey plays with. Delivery is often very quick. Site is easy and intuitive to use! I enjoyed browsing, and really appreciate how things are categorized. My order did take awhile to ship out (a few days, I think), but once it did, it shipped fast. I'll definitely be a repeat customer! Many things to choose from, and it's great that you can order in bulk! Great selection and prices!! I love your website for ordering all my bird toys!!! Excellent selection of toy making parts & prices so low, you’ll be sure to return. I've been shopping here for 5 years now with monthly purchases. Have 2 very happy cockatoos and no plucking! Thank you. BEST bird toy parts available anywhere! All parts are top of the line whether wood, natural, plastic or metal. Cockatoo, Macaw, approved. I love how it's hand written on labels, feels like grandma sent you a package!? Such good prices, and arrives on time. I've ordered several times. Really great place.